You have run your PPSR Check on Quick Revs and got your comprehensive report. But, you notice a section talking about the vehicle you are interested in as being written off Check. That’s because your PPSR report will give you information regarding the write-off status, if any, of the car you’re considering purchasing. However, as these details are often given in strange-looking codes, it can sometimes be confusing to know what you’re reading. So, now the write-off section of your PPSR report is in a code, and you have no idea what it means. But, no need to worry. Let’s take a quick run through of the write-off codes on your PPSR report so that you can understand what it all means. So, what information are you looking at in your PPSR report? Your PPSR report provides several bits of information on a vehicle. It provides you with stolen status indicators, registration details, financing information, and of course, write-off data. Need more information on what is PPSR ? But first, let’s look at what is classified as a write-off. There are two types of write-offs – total loss and repairable write-off. A vehicle that is assigned a statutory write-off is considered a total loss. That means the damage sustained prevented the car from being driven safely on Australian roads. A repairable write-off means that the vehicle is too costly to repair. But, it could be re-registered as road-worthy if it passes a vehicle safety and identity check. These laws may vary by state so check your local statutes. The car written-off check free that come through the NEVDIS is unformatted. But the PPSR formats the data for you to get a clearer picture much faster. This is one of the reasons why you should enjoy using the PPSR over the REVS report. What do the Write-off Codes on the PPSR Certificate mean? 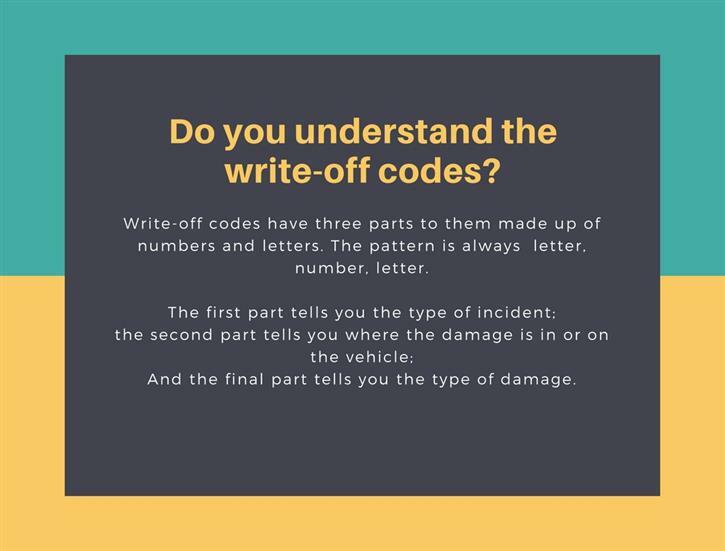 Write-off codes have three parts to them made up of numbers and letters. The pattern is always letter, number, letter. These codes are standardised across the country, so anytime you get a damage report, be it through a PPSR check or insurance claim, you can reference the list we compiled for you below and see what it means. How to check if a car has been written off ? So, the code is to help you understand the type of damage the vehicle sustained. And it gives you information on the location and severity. The first part tells you the type of incident; the second part tells you where the damage was located in or on the vehicle; and the final part tells you the severity of the damage. Therefore, the write off code H8B means [Hail | Roof | Light panel damage]. Here’s a second example using F20H which means [Fire | Floor plan (rear passenger) | heavy stripping]. Now you can read your PPSR certificates with ease as you know exactly how to interpret the write-off code. Just for you, we have included the full list of the PPSR write-off codes below. Bookmark this page so that you can access this list anytime you need it. Dismantled - Legitimate removal of components for use as parts. Fire - Damage caused by combustion. Hail - Damage caused by hail stones. Impact - Collision of some type with an object, for example another vehicle, tree or pole. Malicious/Vandalism/Stripped - Intentional damage, for example broken door locks, glass window or windows, paint, scratched or stripped of all or a combination of interior and exterior body parts. Water - Damage caused by water (fresh or salt) such as a storm, river or flood.